You don’t have to make a reservation or to bring anything. Simply show up anytime during open hours and get ready to play! If you would like to save some money and guarantee a time slot please book online! Players will be mixed in with the crowd by age and skill level. Upon arriving at our facility players will be checked in and then receive a full safety and game rule presentation. You will then be split into teams based on age and skill level by our staff. 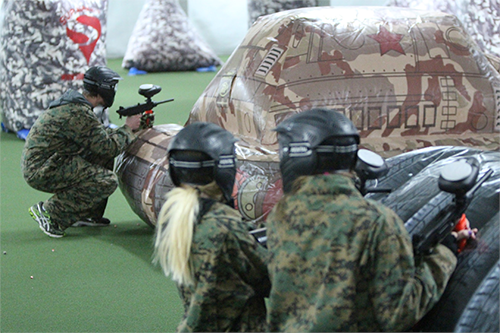 Teams will then be lead onto the paintball field and accompanied at all times to ensure safety and enjoyment. Teams will play a game, switch sides and play again. After the rounds are played players will exit the field, get cleaned up, reload if necessary, relax or grab a refreshment and get back in rotation for another match.